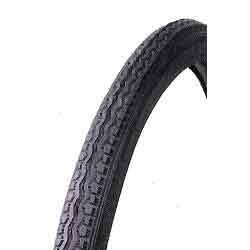 With rich industrial experience, we manufacture, trade, export and supply a huge range of Bicycle Tyre that is available with high quality standards. The offered tyre is manufactured using high quality raw material and progressive technology as per the set industry standards. Provided tyre is highly acclaimed by the clients for its heavy duty capabilities and dimensional accuracy. Clients can avail this tyre at pocket friendly prices. Founded in 1963 as a 100% manufacturing unit of bicycles, "Bharti Exports" has indeed a come a long way to now being a 100% export oriented unit. We are a Government of India certified Export House. Bharti Exports is also a registered member of Federation of Indian Export Organizations (FIEO). The Company has over the years diversified its production and assembly to include a wide range of products including Auto Parts (Bolts, Fasteners, Suspension Parts), Moped Parts, Two Wheelers spares, Tractor parts, Hand tools, Diesel Engines, apart from the usual Bicycle Parts. Since its inception, Bharti Exports, has continued to achieve a double digit growth YoY on an average because of its commitments to products of International Standard with Competitive Prices. Our high-quality products, competitive prices and prompt delivery helped us develop strategic business relations across Asia, Middle East, Europe, Africa and South America. Contact us now to find out why we are consistently the number one choice for our customers.